History: (What If? I#47 (fb)) - In order to teach his son Thor the lesson of humility, Lord of the Norse Gods Odin banished Thor to Earth in order to live life as the mortal Don Blake. His adopted son Loki had already been banished for previous transgressions against Asgard. (What If? I#47) - When the maiden Neri sung a song about how quiet Asgard was without Loki or Thor, the guardian Heimdall shed a tear upon hearing the song. The tear relieved Loki of his banishment in the form of a tree, as he was to be banished until someone shed a tear for his plight. Upon his revival, Loki immediately set into motion his plan for revenge against Odin and cast a spell to show him the location of Thor. Finding Thor in the form of Don Blake, Loki found that Mjolnir, the hammer of Thor, was in the form of a gnarled stick inside a Norwegian cave. Discovering that Don Blake had fled from the stone-like Kronans into the cave that housed Mjolnir, Loki transformed himself into a fly and flew past Heimdall to Earth. Loki arrived just before Blake and stole away the cane, able to pick it up as a stick since the spell of worthiness only affected Mjolnir in its uru metal form. In order to keep Odin from tracking Mjolnir, Loki hurled the stick into a forest where it would grow into a tree mirroring the ones in the forest. Eventually, the Kronans broke into the cave housing Don Blake and they killed Blake. Sensing Thor's danger, Odin viewed Thor's death at the hands of the Kronans and immediately destroyed the Kronans for their transgression. Thor soon awoke without his full memory in the land of the dead, where a denizen pointed him towards the golden mountain nearby. While Thor battled the guardian of the mountain, Odin prepared to visit the realm of Hela to bargain for Thor's life. He was soon joined by the Warriors Three and Balder the Brave in his quest into Hela's realm. 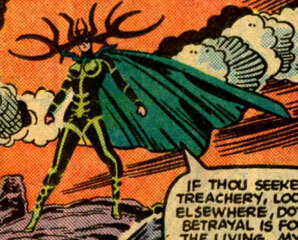 Hela denied Odin the life of Thor as Thor continued his battles in the land of the dead. While Odin battled Hela, Balder began to think that perhaps a man in the land of dead could locate Thor. Just as he thought, a warrior appeared and announced that he could solve Balder's dilemma by killing him. Balder agreed to be killed and the warrior impaled Balder with a spear dipped in mistletoe. The warrior then revealed his true face as Loki and announced to himself that the death of Balder brought about Ragnarok, the end of times, to the Norse Gods. Loki then teleported away as a guard found the body of Balder. With the death of Balder, the Frost Giants reawoke and the Midgard Serpent began thrashing its coils. The troll nations roused themselves and the Fimbulwinter began to move across Asgard, killing everything in its frozen blasts. Upon hearing the news of Balder's death from his ravens, Odin retreated from Hela's realm back to Asgard as Balder arrived in the land of the dead himself. Balder soon found Thor battling for sport and the sight of Balder caused Thor to recall his full memory. As he began fighting the legions of Hela for his freedom, Heimdall and the Warriors Three departed for Earth to locate Mjolnir. They soon discovered Loki guarding the tree that was Mjolnir with a dragon. Loki left the dragon to finish the warriors and as they battled the dragon valiantly, the forces of evil had arrived at Asgard's door. Hela soon appeared to Odin and explained that the lives of Balder and Thor would require a price just as the Warriors Three and Heimdall defeated the dragon and found Mjolnir. Heimdall struck the tree that was Mjolnir and then the warriors were teleported back to Asgard. When they had returned to Odin with Mjolnir, Odin announced that he was to journey to Hela's realm once again and trade his life for Thor's, so that Thor could wield Mjolnir and save Asgard from Ragnarok. In Hela's realm, Thor and Balder continued their fight against Hela's hordes until the Lady Sif arrived and gave her life to save Thor's. With Thor returned to the living, Hela allowed Balder to return to life as well in order to forestall Ragnarok and the two returned to Asgard. Thor returned with a vengeance, driving off Loki's hordes and eventually, Loki himself. Some days later, Odin called Thor to his throne where he was surprised to find that Thor had learned his humility through the trials he had recently went through. Odin allowed Thor one question and Thor asked what price was paid for the life of the Balder, to which Odin revealed that he now only had one eye. Comments: Created by Peter B. Gillis, Kelley Jones, and Sam Delarosa. This reality diverged when Heimdall shed a tear, releasing Loki prior to Thor's return. The Asgardian goddess Idunn was called Iduna in this story. 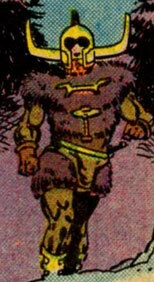 Balder the Brave was the same as his Earth-616 counterpart up until Thor was killed as Don Blake. In order to retrieve Thor from Hela's realm, Balder allowed a warrior to kill him, not realizing that his death brought about Ragnarok. In Hela's realm, Balder found Thor and the two fought their way through Hela's legions until Sif appeared and sacrificed her life to restore Thor's. Hela also allowed Balder to return to life and Thor later learned that Odin sacrificed one of his eyes to bring Balder back. Balder had the typical attributes of an Asgardian, and could not be harmed unless struck with mistletoe, just like his 616 counterpart. Heimdall was exactly like his Earth-616 counterpart up until the maiden Neri caused him to shed a tear near the tree that contained Loki. The tear released Loki from the spell that had transformed him into a tree and Loki set into motion his plans for revenge. When Ragnarok began with the death of Balder, Heimdall rallied the Warriors Three to journey with him to Earth in an effort to locate the disguised Mjolnir. After defeating Loki's dragon guardian of Mjolnir, Heimdall and the Warriors Three returned to Asgard, where Lady Sif agreed to bring Mjolnir to Thor in Hela's realm by sacrificing herself to restore Thor's life. When Thor returned, he quickly drove off Loki and his hordes. 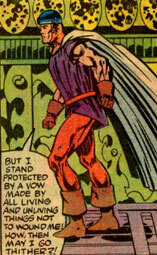 Heimdall had the conventional attributes of an Asgardian, like his 616 counterpart. Hela was the same as her Earth-616 counterpart up until Thor was released into her realm following his death as Don Blake on Earth. Odin soon ventured to Hela's realm to bargain with her over Thor's life but she turned him away just as Loki had set into motion the events of Ragnarok. Eventually changing her mind and agreeing to bargain for Thor's life in order to save Asgard, Hela agreed that another's sacrifice could restore Thor and Balder. Sif then sacrificed her life to restore Thor's and Odin sacrificed an eye to restore Balder. Hela had the conventional attributes of an Asgardian goddess, as well as her control over the Asgardian dead, just like 616 counterpart. 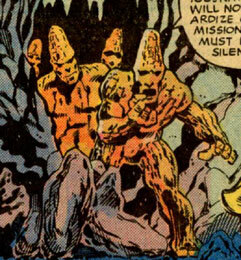 The Kronans, like their Earth-616 counterpart, were stone-like aliens from Saturn. When they arrived on Earth to begin an invasion, they found that human Don Blake had discovered them. Chasing him into a nearby cave, they killed him before he could tell anyone of their invasion. Unfortunately for them, they had killed the mortal housing the Asgardian Thor and Thor's father Odin destroyed the Kronans in his rage over Thor's death. Loki was the same as his Earth-616 counterpart up until Heimdall unintentionally released Loki early from the spell that had transformed him into a tree. Loki immediately set out on a quest for revenge on Odin and soon located Thor's hammer, Mjolnir. Stealing it away and disguising it as an ordinary tree in a nearby forest, Loki made sure that Don Blake was killed without the hammer. With Thor gone, Loki soon killed Balder, setting into motion the events of Ragnarok. As time passed, Loki released a dragon to guard the tree that was Mjolnir. Heimdall and the Warriors Three soon found the tree and Loki left them to the dragon's wrath. Once Thor was restored to life by the death of Sif, Thor drove Loki's hordes away and caused Loki to flee for his life. Loki had the normal attributes of an Asgardian god, as well as mastery of Asgardian magic, like his 616 counterpart. 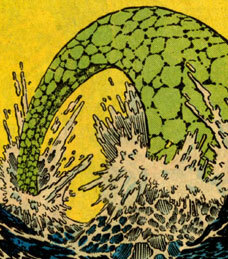 The Midgard Serpent was the same as its Earth-616 counterpart up until Loki killed Balder the Brave and began Ragnarok. With the events of Ragnarok set into motion, the Midgard Serpent began thrashing its coil around Asgard. Neri was an Asgardian maiden known for her songs. During a day in which Heimdall had come to visit her, she sang a song of how quiet Asgard was without Thor or Loki present, a song which caused Heimdall to shed a tear and accidentally release Loki from his prison. She presumably had the conventional attributes of an Asgardian, including superhuman physical attributes and immortality. 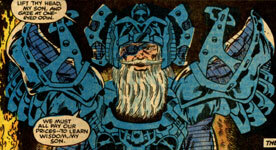 Odin, like his Earth-616 counterpart, was lord of the Asgardian gods. He had sent Thor to Earth in the form of the mortal Don Blake to teach him humility but while Thor was on Earth, Don Blake was killed by the alien Kronans. In his rage, Odin destroyed the Kronans and set off to Hela's realm to retrieve his son. Hela refused to bargain with him and while there, Odin was informed that Loki had set into motions the events of Ragnarok by killing Balder the Brave. Odin then watched as Asgard fell to Loki's hordes until Heimdall and the Warriors Three arrived with the newly-located Mjolnir. Odin prepared to sacrifice his own life to save Thor's and Asgard, but Lady Sif went in his stead. In order to save Balder as well, Odin sacrificed one of his eyes. Odin had the same Asgardian powers that his Earth-616 counterpart possessed. Sif was exactly like her Earth-616 counterpart up until Loki set into motion the events of Ragnarok. In an effort to restore Thor, Sif agreed to sacrifice her own life to restore Thor's and when she arrived in Hela's realm, she presented Thor with his hammer, Mjolnir. 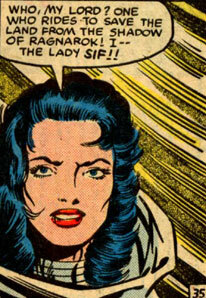 Sif had the same Asgardian physical attributes that her 616 counterpart had. 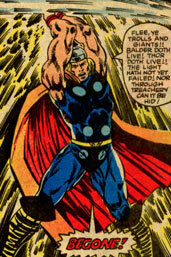 Thor was the same as his Earth-616 counterpart, having been sent to Earth in the form of Don Blake to learn humility. 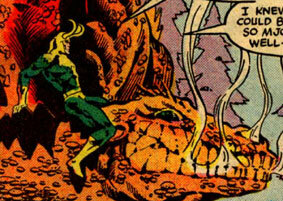 Unfortunately, Loki was released from his prison early and discovered the location of Mjolnir and Thor on Earth. 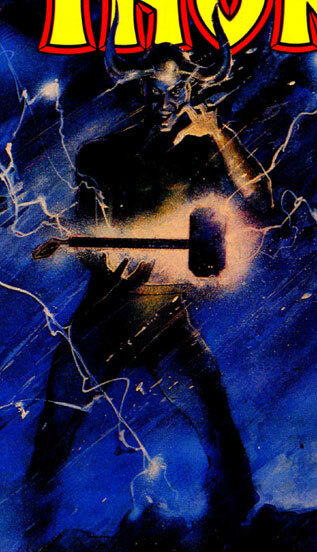 Removing Mjolnir from its cave home, Loki ensured that Don Blake would die at the hands of the alien Kronans. Stuck in Hela's realm without his full memory, Thor battled Hela's hordes for sport until Balder the Brave arrived and restored Thor's full memory. Realizing that Asgard was in danger, Thor and Balder fought their way through Hela's legions until Sif sacrificed her life to Hela to restore Thor's life. Using his hammer that Sif had brought, Thor returned to Asgard and drove out Loki and his hordes. He later learned that Odin had sacrificed an eye to restore Balder's life as well. Thor had the same superhuman physical attributes that his 616 counterpart had. The Warriors Three were the same as their Earth-616 counterparts until the death of Thor. Following Thor's death, they accompanied Odin into Hela's realm in an attempt to bargain for Thor's life but quickly returned to Asgard when the threat of Ragnarok loomed. In an effort to defeat Loki, Heimdall soon convinced the Warriors to join him on Earth to locate Mjolnir. While there, they helped Heimdall fight off the dragon guardian of Mjolnir and they quickly returned to Asgard with the hammer. Odin soon announced that he would sacrifice his life to restore Thor's but the Warriors protested and eventually, Sif agreed to take Odin's place in Hela's realm. All of the Warriors Three possessed the superhuman physical attributes conventional to all Asgardians, just like their 616 counterparts. 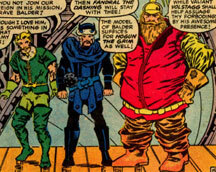 They were (from left to right): Fandral the Dashing, Hogun the Grim, and Volstagg the Valiant.